JIRA can create reports with proper information. We will learn here what type of report has been created from JIRA. It is the best feature which have been given by JIRA. User can save time and get information about each and every piece of project as JIRA created prefect report from information. It will differentiate all the details in proper manner so user can easily understand what the position of the project is. We can see the types of reports in below screen. JIRA tracking issues by creating reports. It shows total estimate of the project, how many time have been taken by a project. What should be the outcome of the project? Here is some definition of reports which have been generated in JIRA. It shows that how many issues are pending or unsolved. Accordingly it will generate a report and give you the particular picture of the project about pending issues. By the name we can understand that it will create reports for created issues and resolved issues report which will display whole the scenario of the project and display the work done by the Team. It will display issues status with different colors so we can identify the project status or sprint status easily. It shows that how much time has been taken by the users for verifying project for the specific period? It will display all the detail for recently created issues which shows that how many percentage of the project is completed and how many project is pending. These are the type of reports in JIRA now we will see how it will indicate status of the project. All the dead line of the project have been followed or not, all the issues are solved or it has in progress status this all can be verified by reports. We can create sprint report, Epic Report, Version Report, velocity chart, control chart, cumulative flow diagram too. Thus, Progress Report has been shown from here. Verify the image; it will display different colors for indicating different information. It displays stating point and ending point of the sprint or project. Blue line indicates ideal task remaining and red line indicates Actual task remaining. Initial days have been displayed here too. Now we can move forward to pie chart. 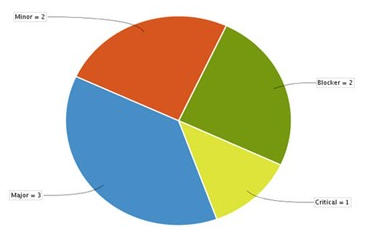 Here in pie chart we can see that different status have been displayed with different colors. This is the reports in JIRA which use to define the Project status or Sprint status.